From the desktop, navigate: Finder > Applications > VZAccess Manager. Select Enter PIN (located in the lower-right corner). The 8-digit key obtained from Verizon Wireless. A PIN code consisting of 4 to 8-digits. 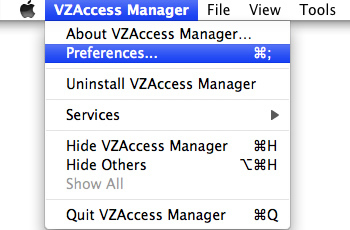 From Menu Bar, click VZAccess Manager > Preferences. From the Security Preference, enter the following information then click Save.